A joint statement on mutual lifting of trade restrictions between Russia and Turkey was signed by deputy prime ministers Arkady Dvorkovich and Mehmet Simsek. ISTANBUL (Sputnik) — Russia and Turkey have signed a joint statement on mutual lifting of trade restrictions, with signatures under the document put by deputy prime ministers Arkady Dvorkovich and Mehmet Simsek. The ceremony was attended by the two countries' prime ministers Dmitry Medvedev and Binali Yildirim. 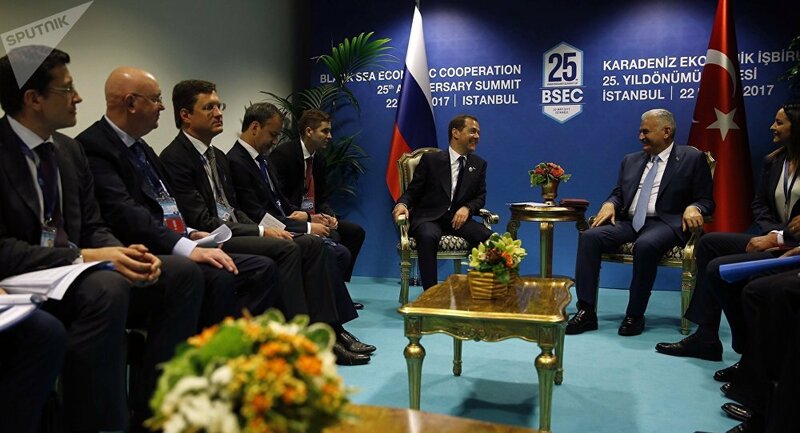 On Monday, Medvedev attended the summit of the Organization of the Black Sea Economic Cooperation (BSEC), on the margins of which he held talks with his Turkish counterpart. As the Russian government's press service has reported, during the visit to Istanbul the Russian prime minister is also expected to hold talks with Turkish President Recep Tayyip Erdogan. Russia’s food embargo against Turkey was introduced on January 1, 2016, in response to the 2015 downing of a Russian aircraft by Turkey over Syria. In October 2016, the Russian embargo on Turkish stone fruits and citrus fruits was lifted aside from a number of vegetable articles. In March, the government exempted fresh and refrigerated onion and shallot, fresh and refrigerated broccoli and cauliflower along with several other products from the ban. In May, Russian President Vladimir Putin met this Turkish counterpart Erdogan in Sochi, with the two leaders agreeing to further ease mutual restrictive measures. Russia, however, insisted on keeping restrictions on Turkish tomato imports as well as postponing the reintroduction of a visa-free regime for Turkish nationals. Turkey, in turn, kept restrictions on Russian grain imports.